Mattress Safe® PillowSafe® zippered pillow encasement. Now you can "sleep safe" knowing that your pillow is safe from mold, stains, bacteria, and dust mite allergen, as unprotected pillows increase 10% in their weight from these elements in just 2 years. 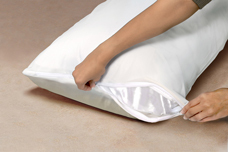 PillowSafe® also aids in the prevention of bed bug infestations in pillows. Mattress Safe® PillowSafe® Pillow Protector features an innovative soft and luxurious yet breathable stretch knit fabric, carefully selected to be designed for comfort and easy care, while providing durability and protection for all applications. Joined to a unique lightweight barrier, Mattress Safe® PillowSafe® Pillow Protector provides waterproof protection against spills and fluids. A fire retardant barrier that does not come in contact with the body has been carefully added and tested by the National Fire Protection Agency and Passing the Cigarette Burn Test - CFR Title 16 Part 1632 (FF4-72) Standard for Flammability. Mattress Safe® products are a cost effective and preventative measure in protecting your bedding investment.